Bloom Creek Cranberry Farm is a small cranberry farm near Olympia, Washington established by Felix and Kathy Mahr in 1998. After working around the world, we came back to our native Washington and selected this site for our farm because it has the ideal elements for growing this traditional American fruit. Cranberries thrive in the warm summer weather, clean glacial sand and abundant water resources present on our land. We use sustainable farming methods on our purpose-built upland cranberry bogs using soil amendments and carefully timed flooding to minimize the need for agricultural chemicals. Our Stevens cranberry vines grow bigger, redder and sweeter in the warm South Sound summers than cranberries from the coast. In autumn the cranberries are picked and sorted using the most gentle methods possible and brought to local markets at the peak of freshness. 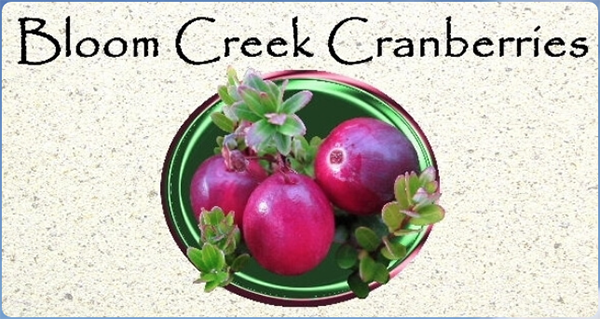 Our mission is to provide the highest quality fresh market cranberries locally to people in western Washington.